Australian herring is named as it resembles the herring of the northern hemisphere, however they are not related. Over east they seem to be called Tommy Ruff or Ruffs, and referred to as Herring in Western Australia. 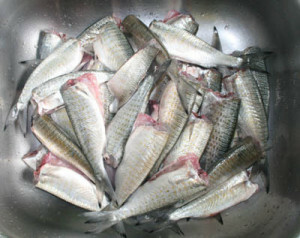 Australian herring grow up to 41 cm in length but most are caught at about 20-25 cm. Only an Australian species, it occurs in the coastal waters of southern Australia, and its lifecycle depends on prevailing currents. Australian herring actually belong to the perch family. The Australian salmon (Arripis truttaceus) belongs to the same family, and in its juvenile stage, can be easily confused with adult herring (Arripis georgianus). No bait is needed to catch herring. I use a rig similar to that pictured below (smaller hook) and keep the hole in the bob well burleyed after each, or every second throw. Idea is to cast just beyond the breakers and begin to reel in immediately, keeping a constant steady but quick speed. The green lumo tube is the ‘bait’ and if herring are there you will soon know about it. The morning’s catch on the left is in the sink ready to be filleted. I tend to fillet all the herring and use a marinate to soften the taste. Dalyellup fishing trips seem to be rare at the moment… way too much work and no play. My grand children don’t seem to like the strong flavour of herring so I use the following to take the ‘fishy’ taste away. In a deep bowl pour about one generous cup of milk. Cut a lemon and squeeze the lemon juice into the milk, and stir till it is mixed well. The milk goes a little thick and looks like it is curdled. 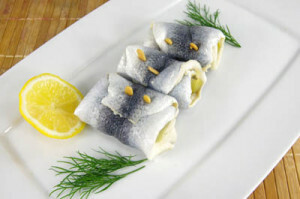 Place the herring fillets in the mixture and mix thoroughly and see that the fillets remain covered. Stand in the fridge for 30 mins or so. When cooking, just take the fillets directly from the marinate into a non-stick fry pan with a smiggin of oil or butter and fry quickly. Lovely served on toast! If I get enough left over fillets I will make up a brew so we have a supply of our rollmops. 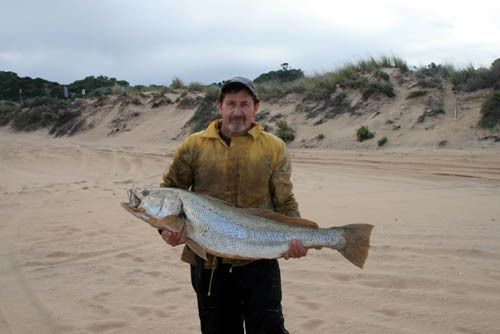 The Mulloway below was caught on a Dalyellup fishing trip in 2013 by Norm a local regular fisherman. A blustery day and only Norm and I on the beach so when he hooked up I waited with the gaff to pull it up. Great size and look forward to catching one myself someday! The Sydney Fish Market has a recipe that looks enticing for when I do catch one.